The Pacific Northwest is known for warm, dry summers and cool, wet winters—and Portland is no exception. Compared to Seattle and Vancouver, Portland is both warmer and drier all year round. On average, the "Rose City" has 144 sunny days and an annual average temperature of 71 degrees Fahrenheit (22 degrees Celsius), making it an ideal place to foster a rose garden. Portland is near both mountains and sea, which means it has what is called a "Mediterranean" climate—though Portland is not as warm as southern Italy. Among U.S. cities, Portland ranks third with 164 rainy days annually. For this reason, the Portland area gets 280 growing days on average and sits in one of the more lush parts of the country. A quick comparison of averages reveals that Portland gets much more rain than the average American city (42 inches versus an average of 37 inches). And even though many days are cloudy and drizzly, it's rare to hit stormy weather or a full day of heavy rain. Despite this reputation for rain, Portland is not one of the top 10 U.S. cities with the highest annual rainfall. The Rose City doesn't necessarily get a lot of rain; it just rains often. Compared to the East Coast or Midwest, where it can rain 2 or 3 inches in an hour or two, it can take days and often weeks to accumulate that amount in Portland. It will be raining for hours, and suddenly the sun will come out for a short time, and then it is back to rain. The tail end of spring includes the sunniest time of year in Portland, which stretches from May through October. In the spring, Portland bursts into bloom as rhododendrons, azaleas, cherry trees, and, of course, roses come into full flower in parks, gardens, and yards all over town. Rain levels are moderate. What to pack: Rain gear is an obvious item on the checklist—umbrella, rain boots or weatherproof hiking boots, and a raincoat or weatherproof light jacket should do the trick. Temperatures are starting to get warmer, but you will still need clothes to keep you warm like a sweater or light jacket. No matter what time of year you arrive in Portland, it's always best to bring clothing you can layer. 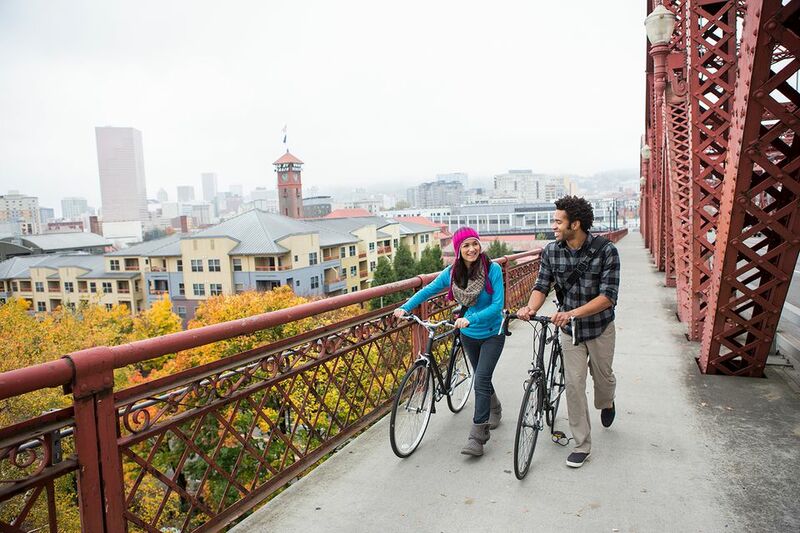 Most visitors arrive in Portland during the summer months, which is a terrific time of year. There is little rainfall (only about 4.5 inches during the entire summer), and days are warm and dry. Even better, while the weather is warm, it's rarely hot: high temperatures in June, July, and August generally top out in the just above 80 degrees Fahrenheit (27 degrees Celsius). August is the hottest month, but if you're from the broiling mid-Atlantic, South, or Southwest, you'll find the weather refreshingly cool. You will also find plenty of outdoor festivals, natural areas for hiking and boating, and outdoor restaurants and bars. What to pack: In the summer, you can likely forego the raingear since the showers are light, sporadic, and usually a welcome sight. You should be comfortable in usual summer gear: T-shirts, shorts, sundresses, and sandals. Don't forget sunglasses and sunscreen. As you move into later September, you will find that the weather becomes a bit more unpredictable. Heat waves and cold snaps are not unusual. At the same time, the clouds will begin to move in. Expect drizzle and gray days, but no major weather events. Hurricanes, thunderstorms, and tornadoes are very rare. What to pack: Something you should bring year-round is hiking boots. All months of the year can be considered suitable for a nice hike through the parks and trails in and around Portland. Fall is another good season for packing clothing to layer for the cooler evenings in late fall. Summer may be more crowded, although, for many people, the misty green forests and mountains of winter are more attractive than bright summer days. And even in the depths of winter, you'll almost certainly be able to hike and explore the gorgeous scenery of the Pacific Northwest. By December the weather is fairly cold though, although, not really if you are comparing it against a state like Minnesota. Portland temperatures hover above 40 degrees Fahrenheit (4 degrees Celsius), and it's rare to have a true freeze. Even in mid-winter, rain is more likely than snow. In fact, the average snowfall in Portland is just 4.3 inches, and that little bit of snow generally falls over the course of just a day or two. The first frost is usually in early November, and the last frost is usually in early April. What to pack: Temperatures can dip into the 30s F (below 4 degrees Celsius) at night, so you will definitely want to pack a winter coat and usual winter gear like gloves, scarf, and a hat. Bring weatherproof boots, as December is Portland's wettest month. The City of Portland is not the rainiest place in the metro area. Parts of the metro area receive 64 plus inches per year, which is 15 inches more than Portland’s official rainfall measurements that are taken at the airport, one of the driest spots in town. Downtown Portland receives just over 42 inches of precipitation annually. The rainiest parts of the Portland metropolitan area are Damascus and Happy Valley. What Kind of Weather Can I Expect During My Visit to Portland, Oregon?